A basic hydroponics system can be set up so simply and cheaply. I’m as much a plant lover as I am a fish lover. I also have all sorts of old fish tank equipment, which I decided to make use of. 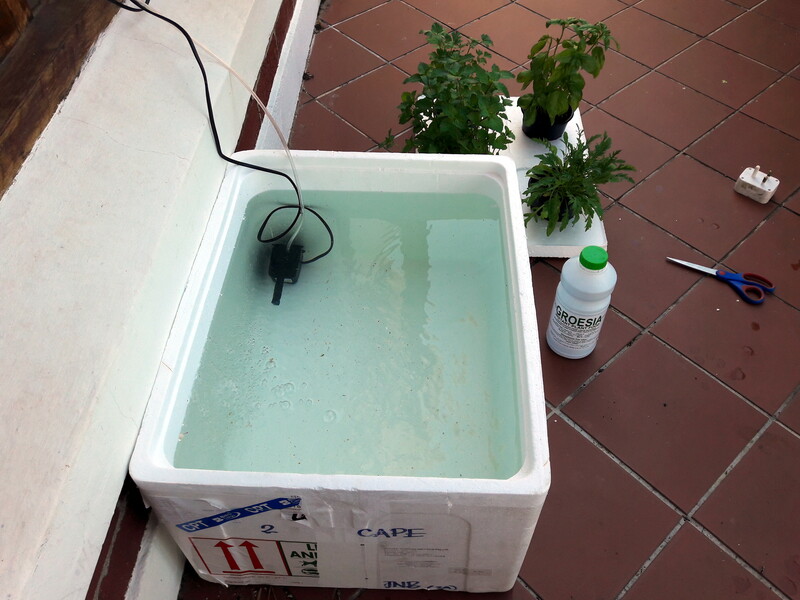 The basic hydroponics setup pictured below uses a polystyrene box and a fish tank pump. I sourced the below polystyrene box from a pet store, and the owner was more than happy to rid himself of it! (There are strict regulations with regards to the discarding of polystyrene, so a lot of the other stores I approached simply said that they didn’t have any). This was despite telling them that it was to be used to create a basic hydroponics system. For the fish tank pump, I removed the bottom bit and positioned the top in the bottom-corner of the box to create a decent circulation (obviously plugged into an electrical socket). I inverted and trimmed the lid of the box so that it fit snugly. Try to keep the minimum amount of surface water exposed to prevent evaporation. You then purchase your herbs or plants of choice, decide where to place them in the lid, and draw circles around the base of their containers. Use a sharp knife or similar cutting device and cut out circles as accurately as you can. Place your plants (still in their containers) in the cut-out holes and wedge them in a bit. And you’re pretty much done! To feed the herbs in my basic hydroponics system, I add a couple of cap-fills of liquid plant fertilizer once a week; and they are thriving! I struggle to keep most of them under control and trim them often. You will be amazed at how well plants grow in a simple hydroponics system when they have a constant source of water and nutrients! Fresh, homegrown herbs are also a great thing to gift to family and friends, or you could dry them in brown paper bags so that nothing goes to waste. Regarding sunlight, it really depends what you’re growing, but because the plants are constantly hydrated, reduces the chance of sunburn tremendously. In fact most plants in a simple hydroponics system setup will grow even faster if exposed to a lot of sunlight. I hope you enjoyed that and are inspired to give it a go. 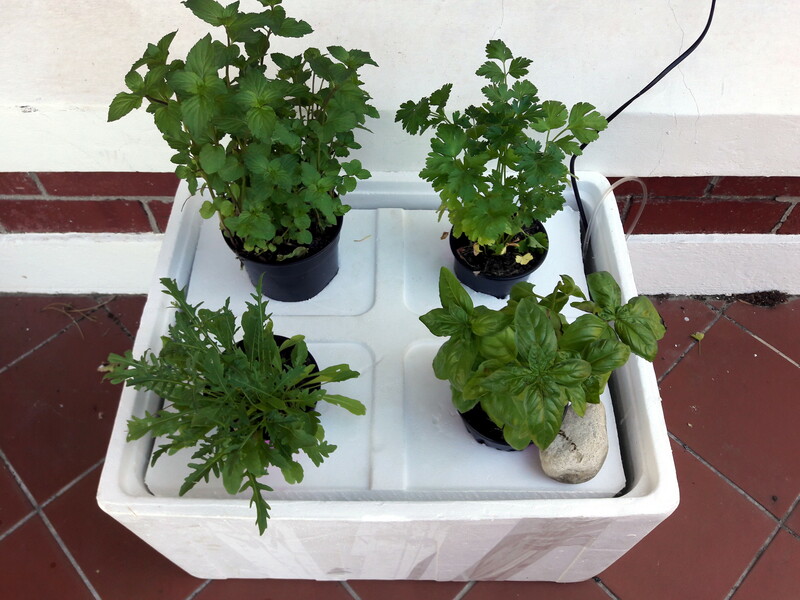 There is such great pleasure in growing your own herbs in such a simple hydroponics system. You could substitute plant fertilizer with live fish, but you would then need to ensure that there is an adequate oxygen supply, and hire fish that are happy to live in the dark to do the job.